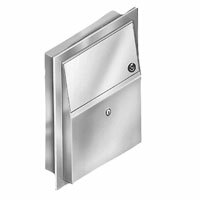 [XPB-4722-1015] This Napkin Disposal is fabricated of 22 gauge stainless steel with exposed surfaces in a satin finish. Feminine napkin disposal mounts 4 inches into wall and extends 2 9/16" from wall. Napkin disposal features a 1.5 Gallon Receptacle, Self Closing Push Flap Door, Tumbler Lock with Keys and a Removable Wax Liner. Stainless steel napkin receptacle secures into 4" recessed cavity in wall through predrilled mounting holes with included mounting screws. Rough wall dimension for receptacle is 11"W x 15 3⁄8"H x 2 1/2"D. For shipping quotes, specifications, orders or questions please call our Customer Service Center at 1-877-483-9270.